The Gloster Meteor is single-seat, all metal twin jet engine aircraft with retractable gear. The Gloster Aircraft Corporation started in 1939 the development of a jet aircraft following the Air Ministry specification E.28/39. The Gloster E28/39 first flew on 15 May 1941. This experimental aircraft was built to test the new gas-turbine engine W.1, developed by Frank Whittle. Development of the Gloster Meteor started in 1940 following the Air Ministry specification F.9/40 for a jet fighter. The F.9/40 was first known as the Thunderbolt, but soon renamed Meteor. Designed by George Carter eight G.41 Meteor prototypes were produced. This low-wing jet aircraft was originally engined by two de Havilland Halford H.1 jet engines. For the production G.41A Meteor Mk.1 the engine was switched to the Rolls Royce Whittle W.2 engine. The Gloster Meteor was the first operational jet to fly with the Royal Air Force with deliveries starting in July 1944. The first combat success by a Meteor F.1 against V1 flying bombs was on 4 August 1944. The G-41C Meteor Mk.III was the first variant to go into full production with deliveries to the RAF starting in December 1944. The G-41F Meteor Mk.IV entered production in 1947. This variant was the first jet-fighter aircraft with the L.S.K.- Luchtstrijdkrachten in the Netherlands with deliveries starting in 1948. To keep the Meteor design up to date and compatible, Gloster decided to perform a significant redesign of the F.4, resulting in the G-41K Meteor F.8. The first Meteor F.8 flew on 12 October 1948, the type being phased out of production in 1954, the last machine leaving the Gloster assembly line on 9 April of that year. The F.8 was the most built of all Meteors with 1.522 being produced. Of this production Fokker built 300 F.8s in the Netherlands and Avions Fairey in Belgium built 30 from kits supplied by Fokker and 37 from kits supplied by Gloster. 268 Meteors have served with the L.S.K. and the RNethAF. The Dutch ordered 38 Meteor F.4 and later obtained 27 used F.4s from the RAF. Next to the Meteor F.4, 43 Meteor T.7 trainers were ordered. Finally 160 Meteor F.8 served with the Dutch, 155 built by Fokker and 5 ex RAF. In March 1953, the Fokker built Gloster Meteor F.Mk.8 c/n 6466 was delivered at Soesterberg as '3W-50' to the 322 sqdn. of the L.S.K. Within a week the aircraft was damaged in a landing accident. The aircraft re-entered service in November 1953. The next incident with this airframe, re-serialed '3W-50', took place in May 1954. The canopy exploded in flight. In spite of the damage the aircraft landed safe. October 1956 the aircraft re-entered service as '7E-12' with the 327 squadron. Early 1957, the Meteor was moved to the 322 sqdn. as '3W-32'. On 28 May 1958, the airframe was phased out, but the Meteor survived as a monument at Soesterberg AFB. Since 1958, the Meteor was on static display first as 'I-187', but in 1981 the registration on the aircraft was changed to 'I-147'. Striking on the displayed aircraft is that it carries the red of the 327 squadron at the top of the tail and on the nose, although the last operator was 322 squadron that carries blue. After over forty years of open-air display at Soesterberg AFB the airframe was in bad condition and the canopy is missing. 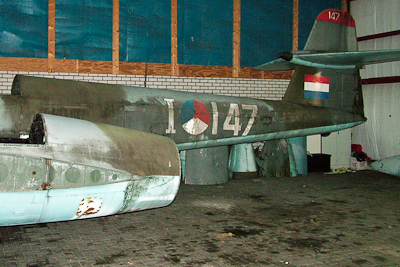 The I-147 page gives an idea of the condition of the 'I-147' when on display at Soesterberg AFB in September 1982. On 14 February 2006, Gloster Meteor F.8 ‘I-147’ arrived at Hoogeveen airfield. The new owner of the Meteor was ATN Aircraft Division a specialist in restoration of aircrafts. 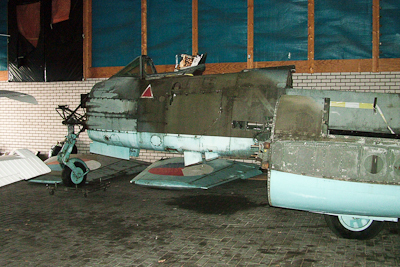 After the restoration of the aircraft, it should be displayed on a pile at Hoogeveen airfield. This plan did not go through and the aircraft was donated to Aviodrome. Early 2009, the Gloster Meteor was moved to Lelystad. Today, the aircraft is displayed in a much better condition by Aviodrome as 3W-32.